Five years ago this weekend, a powerful storm tore through the heart of Northern Minnesota's Boundary Waters Canoe Area Wilderness. The region's signature trees cracked and fell over thousands of acres. Now, the forest is growing back. But officials warn there's going to be a risk of catastrophic wildfire for many years to come. Duluth, Minn. — It was shocking. It was heart breaking. It changed the Boundary Waters for as long as we'll know. They called the storm a derecho - a big storm with straight line winds like you'd expect once every couple of hundred years. It struck on a Sunday afternoon - the fourth of July, 1999. 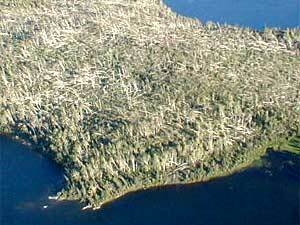 The winds mowed towering trees - especially in a 40 mile swath from Ely to the Gunflint Trail. In its wake, a twisted mess of pine and aspen - and the danger of a very big fire once all that wood dried out. Jim Sanders is Superintendent of the Superior National Forest. He's been obsessed with reducing the danger to people from fire. But he can't make the risk go away. "That hasn't happened yet," Sanders says. "We've had some fires that have started in the blowdown, or in the Boundary Waters, and we've been able to address them immediately because of how we've geared up with our partners in terms of fire suppression. But, when the wrong fire starts in the wrong place, at the wrong time, we will have a large fire," he says. Now, controlled burns are reducing the fuel that can feed a big fire. Resorts have installed powerful sprinkler systems ready to soak buildings and surrounding property. Evacuation plans are in place. "The point is, everybody is prepared, and understands that, says Sanders. "It's not a risk to be afraid of, it's a risk to be smart and to be aware of and to have our preparations in place." The risk will last another 10 or 15 years - most likely in the late summer months - as long as the mass of dead trees hangs off the ground. Still, there's a new forest creeping in. To Lee Frelich, the blowdown doesn't look bad at all. He's a biologist with the University of Minnesota. "Well, to me it looks great," Frelich says. "Of course, I have strange esthetics. I always thought disturbed forests were beautiful after big blowdowns or after big fires." Downed pines and aspen are giving way to fir and spruce, cedar, and paper birch trees. And they're coming up quickly. "You know, the understory of trees that were beneath the big trees that fell - these understory trees were so thick that in many places it looked like a forest right after the blowdown," Frelich says. "And after five years worth of growth where these smaller trees are putting on one or two feet a year, almost everywhere in the blowdown it looks like a forest again." On the Kekekabic Hiking Trail, there are new views of once hidden wetlands and lakes. A controlled burn has revealed geologic wonders on a Seagull Lake island. "It's absolutely beautiful," says Frelich. "It has a whole series of pink granite hills, alternating with little valleys which are full of black charcoal soil. So you have these alternating pink and black, and it's really quite something," he says. "And I'd never been able to see it before. I never knew what the land really looked like on that island." And there's more. Frelich says red maples are appearing in the newly opened forest - where they wouldn't have survived just a few decades ago. They're here, he says, because winters aren't as cold as they used to be. And, while blowdowns are natural, it's conceivable that increasingly warm and humid weather will generate more of the strong thunderstorms that flatten timber. If global warming is behind this, more blowdowns may be in the future. And with hardwoods like maple creeping in, the future north woods might look a lot different than it used too. The 1999 blowdown could be just the beginning.